Despite considerable Sterling weakness following the Brexit referendum in June 2016, the UK trade balance has refused to improve. The data, released by the Office of National Statistics yesterday, attests to a deterioration of the UK’s current account and a worsening balance of payments problem. The significance of this data release should not be underestimated and the effect upon sterling currency markets will be neither insignificant, nor short-lived. The headline figure released by the Office of National Statistics showed a widening of an already significant current account deficit. Quarter Two UK total trade in goods and services stood in deficit to the tune of £10.8 billion, up from Q1’s £2.9 billion deficit in Quarter One. The current account is inextricably linked to the national capital account which measures the inflow and outflow of capital, money. Both headline figures and their underlying dynamics will affect currency markets. The national current account measures the value of goods and services imported and exported from the domestic economy. The deficit figure quoted above is obtained by taking the value of exported goods minus the value of imported goods into the economy, valued in the domestic currency. Given that imported and exported, i.e. tradable, goods and services are necessarily exposed to international conditions dominated by foreign exchange rates, the link to forex markets is unsurprisingly significant. A worsening of the current account will, in the absence of counterbalancing capital markets linked to financial services and transactions, create a greater outflow, or supply, of the domestic currency than demand. Each unit of UK exportation will require a purchase of Pounds Sterling to facilitate the transaction, raising the demand for the Pound. By corollary, it is also apparent that each import is satisfied by increasing the supply of pounds, when domestic currency holders sell Sterling, in order to purchase an international counterpart and facilitate the exchange of a good or service. Therefore, a worsening of the current account dictates that during the period of observation the current account generated pressures that increased the supply of Pounds Sterling without a compensating increase in demand. Should both market forces balance, the value of the Pound Sterling, assuming for a moment that it were purely down to trade, would worsen. If supply outstrips demand, however, then the value of the currency will fall accordingly. Given that this data and information is not available instantly throughout the quarter, the statistics release causes a reaction within foreign exchange markets whereby the trade effect is priced in along with future expectations. In the specific case of the UK, the current account looks to be in an ideal condition to appreciate and even generate a surplus. This is because interest rates are so low, lowering the cost of borrowing to finance internal investment and business with an extremely weak exchange rate. Therefore, domestic goods sold abroad appear incredibly cheap when exchanged for the relevant currency, increasing the competitiveness of UK exports. For example, against the US Dollar, UK exports to the US appear 15% cheaper due to the exchange rate depreciation following the Brexit referendum result. If, as has proved to be the case, UK exports cannot exploit these unique conditions effectively, then concerns over the health of the UK economy are justified, leading to negative speculation against the Pound and the UK economy. Expectations for a stable, and even improving, inter-quarter and inter-month current account performance were violated strongly. Therefore, investment and speculative decisions may have been revalued at the time of the data release, leading to an immediate sell off of the Pound Sterling. As is shown within the graph below, this expectation has been verified by a strong spike coinciding with the data release. The release is severe because it generates further expectations that the export performance of the pound sterling, and therefore the demand underpinning the currency, may continue to be weak whilst Brexit uncertainty looms. It may also undermine slightly the expectations of an imminent tightening of monetary policy by the Bank of England in a few weeks’ time. GBPUSD – cable. 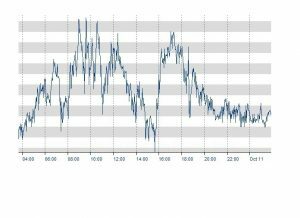 The value of the Pound Sterling against the Dollar following Tuesday’s morning release can be seen to fall considerably. The longevity of the weak current account data will be considerable given the pricing in of future expectation of weak export market performance.